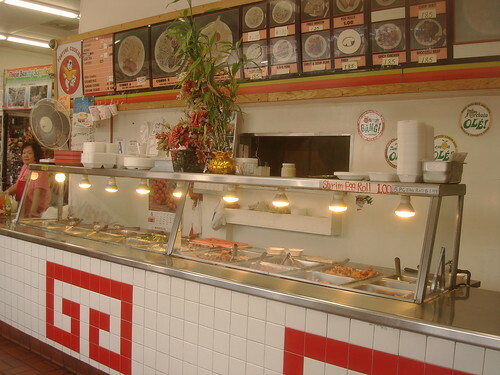 I become mesmerized in the presence of cheap Chinese food steam tables (you know- the ones where you point to what you want), and I know there are some of you who are with me… after all, how else would so many of them exist in L.A.? How do you know if you’re afflicted with cheap Chinese food-itis? It’s pretty simple actually. At mall food courts, do you find it difficult to choose anything but the place that has the best free samples of orange chicken? 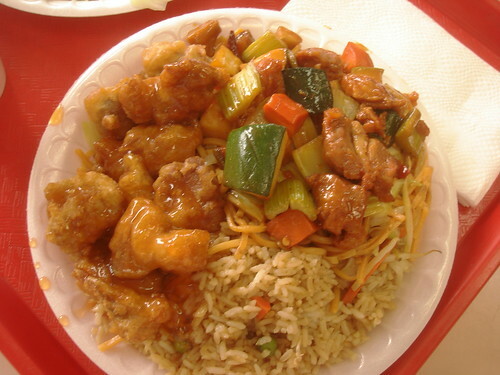 When you travel, have you ever walked to another terminal hoping for Panda Express (but willing to settle for Manchu Wok)? 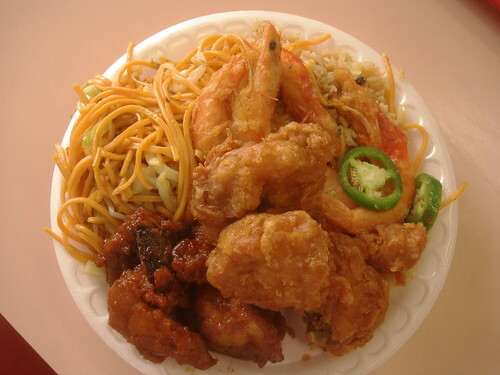 Do you find yourself wanting to try every single crappy looking Chinese place you drive by? Well, I’m here to help. Awful looking is a relative term, but Fortune Cookies looked pretty terrible from the outside- even by my standards. I was genuinely nervous about this one, until we got inside and saw the spread. Not the best ever, but certainly not the worst either… and the price was right. You get rice *and* noodles plus one item for $3.69, two items for $5.30, or three items plus rice and noodles for $6.70. Variety is really the only reason to eat at a steam table place like this, so there is no question that the 3 item combo is the way to go. In fact, as long as it’s under $10 I’ll always choose the largest combo a place offers. What’s that? You’ll do six items on a plate with rice and noodles? Load it up. 17 things? If you can find the room, and it’s under $10, I’ll order it. Thankfully most cheap Chinese food places will only do 3 items in a combo, or else I might not be alive today. Fried chicken is always a good bet at places like this (and popular to boot), and their version was very good. Crispy and well seasoned. The fried shrimp with the heads still on? Not nearly as popular, but I can’t resist it… it’s a “big money item”, so to speak, and when done well they’re delicious. (It also gives you extra ammo for grossing out your squemish co-worker, if you enjoy that sort of thing.) Not bad. I left the crispy and salty shells on, and lived to tell about it. I rounded out my plate with some kind of sticky dish chicken that had been covered in some kind of sweet and mildly spicy sauce. If you like it sweet and sticky (I do), this is a must order. Even though Cathy’s original challenge said pretty clearly that she wanted me to take the bullet for her (which I’m more than willing to do for any of you!) she ended up tagging along. I’m not sure if she was inspired by my bravery, or she just enjoys watching short fat Jewish guys stuff their face with disgustingly cheap Chinese food, but either way it meant we got try a few more dishes! The sweet and sour chicken was a little better than average, simply because they kept the sauce on the side until it was served- insuring that the chicken was about as crispy as could be expected in a situation like this. It also was made with what was clearly dark meat chicken (always a good thing when there is identifiable chicken beneath all that breading), making it more flavorful. I don’t remember the kung pao chicken having much of a kick, but I also don’t remember it being horrible… so that’s kind of a win overall. Their fried chicken dishes are pretty tasty! Horchata with your cheap Chinese food? I love it. 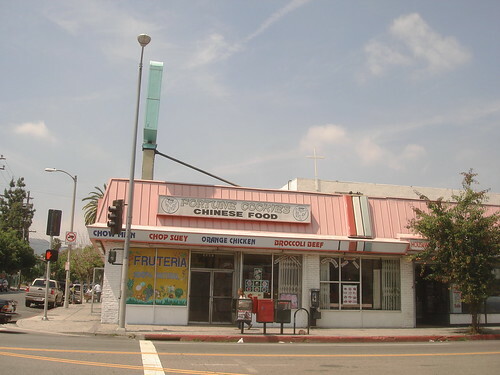 Posted by Zach Brooks at 11:45 am, June 14th, 2010 under Chinese, Fortune Cookies, Hollywood, Strip Mall Chinese Food Challenge. Have you lunched through SGV? So many great finds there. Eating at good Chinese food places? That isn’t much of a “challenge” now is it? You must log in or register to post a comment.